Should We Be Worried About Russian Rockets? A view of the Soyuz MS-10 spacecraft which launched Oct. 11, 2018, as it experienced an anomaly that led to an abort. The crew landed back on Earth and was successfully recovered. The failed launch of the Soyuz MS-10 spacecraft with two space fliers aboard adds a new chapter to an already long story of mishaps and failures besetting the Russian space industry, according to space safety experts. The incident that happened yesterday (Oct. 11), was the first aborted launch of a manned Soyuz capsule in more than three decades. However, it points to serious underlying problems that undermine trust in the space power, Tommaso Sgobba, the president of the International Association of the Advancement of Space Safety, told Space.com. Among the more prominent fiascos of the past decade are three losses of the robotic Progress M vehicle that delivers supplies to the International Space Station, two satellites for Europe's Galileo satellite navigation constellation placed into an incorrect orbit, and the debacle of Phobos Grunt — an ambitious Mars sample-return mission that crashed into the Pacific Ocean two months after launch. All of the three losses of the Progress M cargo vehicle, which took place in 2011, 2015 and 2016, were later traced to problems with the third stage of the Soyuz rocket. The two Galileos were stranded in a useless orbit following a partial failure of the Fregat upper stage, commonly used with Russia's Soyuz and Zenit rockets. A faulty Fregat was also behind Phobos Grunt's failure to leave Earth's orbit. According to Michal Vaclavik of the Space Office of the Czech Republic, a former Soviet satellite country that is now a member of the European Space Agency, the Soyuz FG rocket, which is used for crewed flights, is a more advanced version of the Soyuz rocket commonly used for launching satellites. 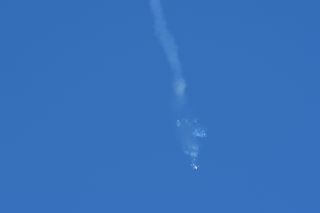 The FG was the rocket used in the failed launch yesterday(Oct. 11). Since its maiden flight in 2001, the rocket has performed 55 successful launches and has been, in combination with the Soyuz capsule, the only means of transporting astronauts to the International Space Station since the retirement of NASA’s space shuttle fleet in 2011. "There is more attention paid to reliability during manufacturing of hardware for manned flights," Vaclavik told Space.com. "There are more inspections during assembly, more testing." Sgobba agrees: "When we compare the reliability of the Soyuz manned version with the Soyuz unmanned version, which of course shares a number of common parts, then we see that the rate of failure has been much higher for the unmanned version." In fact, Sgobba said, the Russians have not lost any cosmonauts since 1971. In comparison, failures of NASA's space shuttle program killed a total of 14 astronauts aboard the orbiters Challenger and Columbia in 1986 and 2003. There were, however, several close calls for the Russians, Sgobba said, including a 1983 launch abort on a launchpad and a 2008 failure of a re-entering Soyuz capsule to separate in time from its service module. As a result, the capsule hit the atmosphere at the wrong angle and the crew had to endure a much bumpier return to Earth than usual. "If we look at the track record of the past almost 40 years, we can consider this to be a rather reliable system," Sgobba said. He added that he was personally more concerned about the hole that had been found in the previous Soyuz capsule — MS-09 — which docked at the International Space Station this summer. Ground controllers detected a dip in air pressure inside the capsule on Aug. 30. Originally, officials thought the capsule's shell had been pierced by a piece of space debris or a micrometeorite. An investigation, however, showed that the hole was likely man-made and created sometime during manufacturing. "It's not clear what had happened, but they apparently didn't find it during inspections and testing on the ground," Sgobba said. This incident, he said, points to a major issue — the lack of proper quality- assurance procedures in Russian space manufacturing facilities. "The Russians don't seem to have made the transition towards modern quality- control methods," Sgobba said. "They don't seem to have proper written procedures that would prevent mistakes from being made. The old experienced generation of engineers has retired, and there don't seem to be any systematic training of the young ones and procedures for them to follow." Sgobba said that emerging commercial spaceflight companies should take lessons from the Russian history of failures and make safety management and quality control an inherent part of their manufacturing practices. "Sometimes, bureaucratic measures are needed to establish a good quality and safety policy inside the company and prevent accidents and failures from happening," he said. Follow us on Twitter @Spacedotcom and on Facebook. Original article on Space.com.